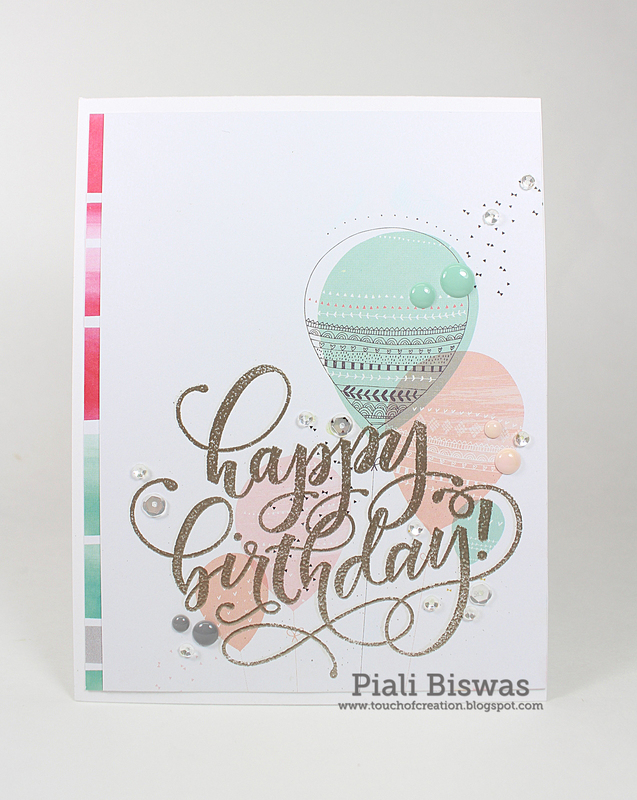 Today I have a layout using SEI paper collection to share with you all. I used beautiful Summer Woods collection for this project. Love the summer camping theme and outdoorsy look of this collection. 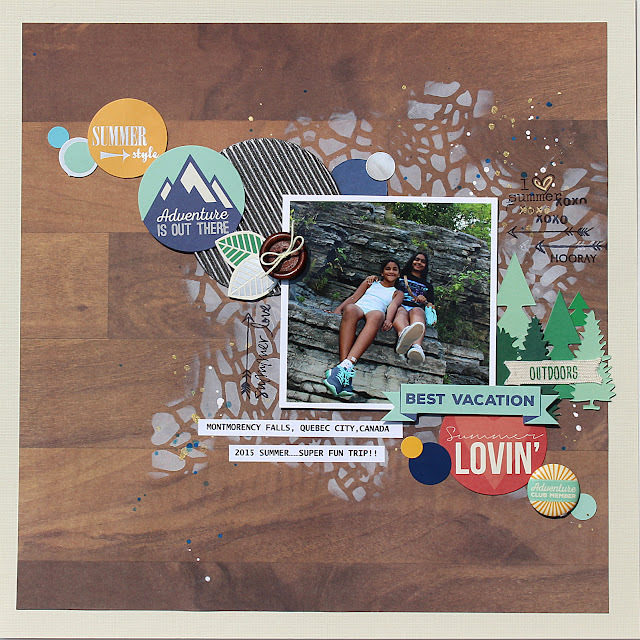 I didn't use any cut files for the layout, the diecut pieces from Sundries pack were perfect for title and more. 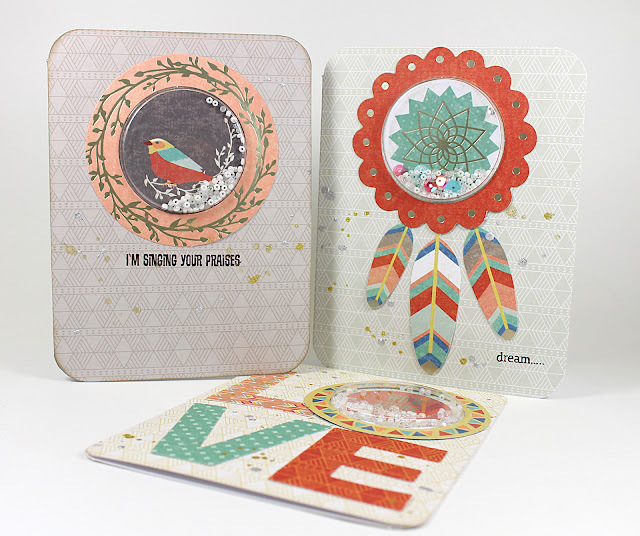 The canvas stickers are super fun embellishment, adds a great texture to a project! Love the flair buttons !! I also used the wooden buttons, corrugated circle diecut & twine from the Sundries pack. For the background and sponged ink over a stencils and created splatters using SEI Tumble Dye sprays. The Tumble Dye sprays are great for papers too. 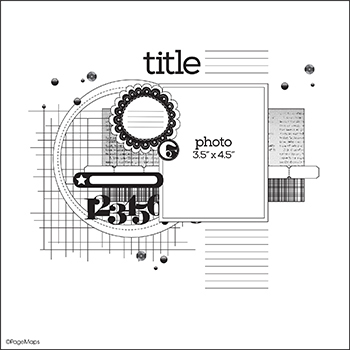 Scrapbook Stamp Society Challenge Blog - Anything goes but not card. Hope you like the layout! I'm on DCWV blog today, sharing a fall themed gift idea!! Finally it looks like fall with the leaves changing colors...and the weather is getting a bit chilly too. Fall is my favorite season!! I love the fall leaves...today my project is all about fall leaves. I used the Glided Stack papers , now available in A.C Moore. I also used adhesive back cork stack, Glitter papers. I loooooove the Gold foiled papers from the Gilded stack. The woodgrain prints are perfect for the fall leaves too. I made a card and a candle gift. I used some May Arts natural twine and some sequins from A.C.Moore. 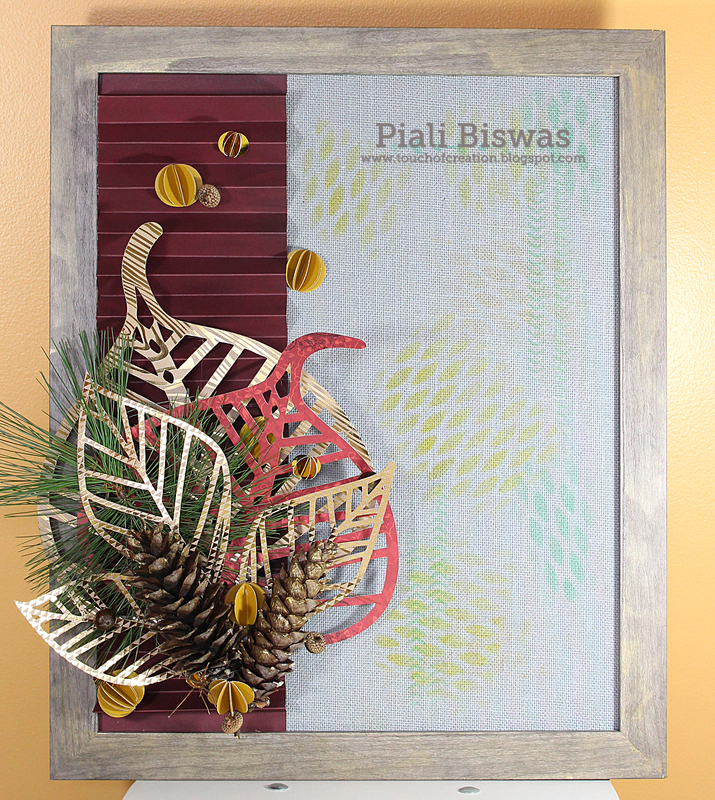 Various leaf diecuts with different prints & texture look great together. 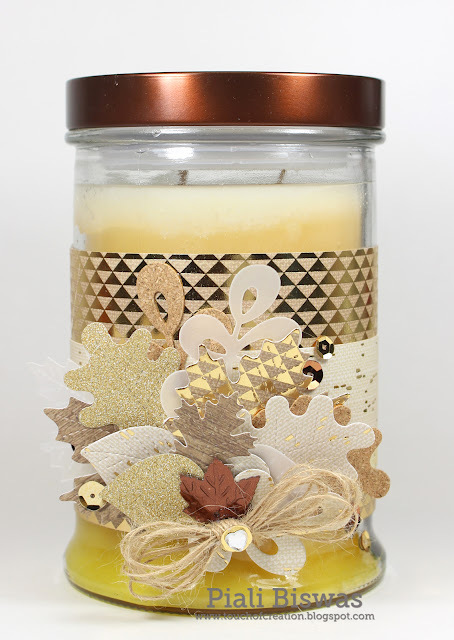 Crafty Sentiment Designs- Autumn Leaves. Try It On Tuesday- Autumn. Die Cuttin' Divas- Anything Goes. Hope you all like this project idea! If you get a chance visit your local A.C. Moore for all the latest & greatest DCWV products. Today I have a CAS birthday card to share with you all. I made this card for a dear friend! 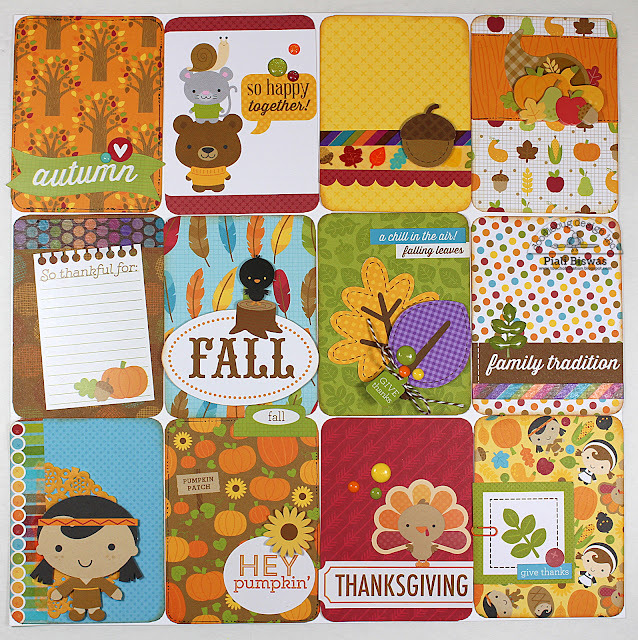 Love this patterend papers from Pinkfresh Studio. I used one of my favorite stamps from Mama Elephant. 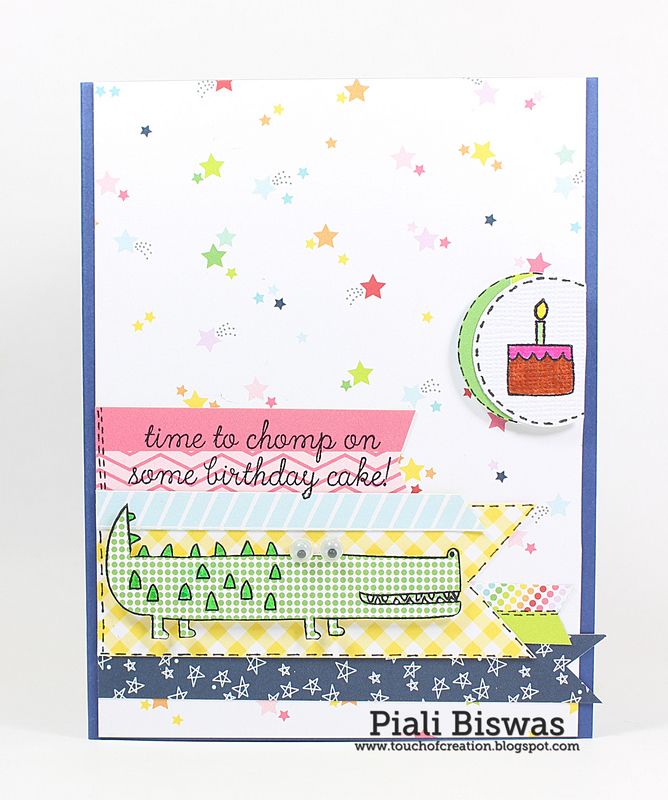 Love that beautiful B'day stamp. I heat embossed the sentiment and added few enamel dots & sequins. Crimbo Crackers- For someone special. Seize The Birthday - Birthday. 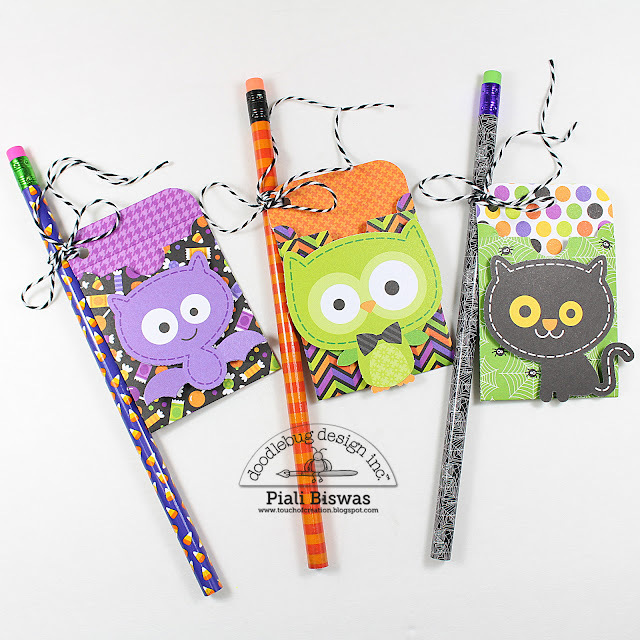 Today I'm on Doodlebug Blog sharing some fun Halloween cards & treats. October 31st is super cute & Fun collection!!! I made few Halloween cards.. I used the 4x4 prints and Doodlepops for this card. I also added few mini tag stickers & Sprinkles. How cute is the owl?? Quick & easy using diecuts, stickers & sprinkles. I also used the washi tape and diecuts from the craft kit. Retarte - Anything goes with Halloween twist. Nowadays , we are not allowed to give out candies in my daughter's school for Halloween. I got some pencils and stickers for her friends. The Mini pockets envelopes are perfect size for the stickers. I made some envie-tags for the kids. I tied the envelopes to the pencils using Doodlebug Twine. I embellished the envelopes with the diecuts from the craft kit. I love how this turned out...super cute and fun!! 3 done...now I have to make 17 more for her class. Hope you like these quick & easy projects. 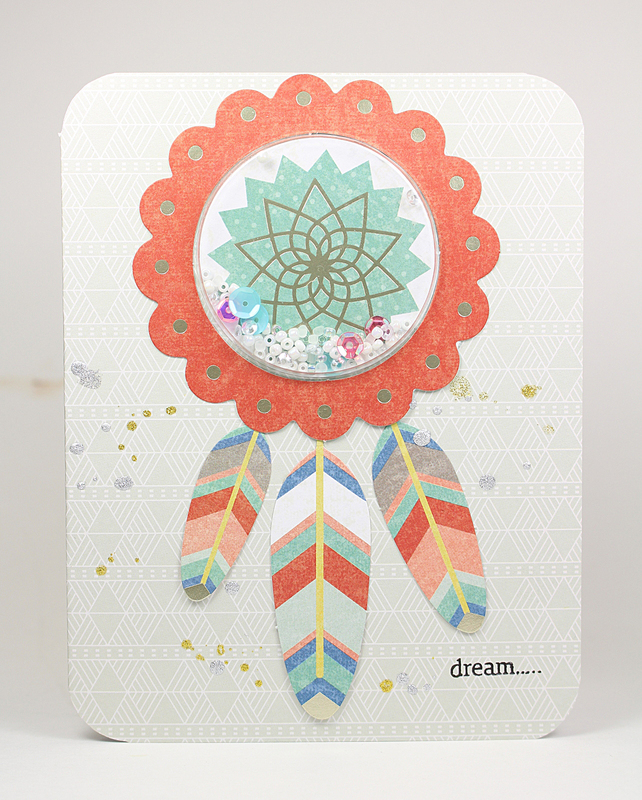 I used the beautiful Daydreamer collection. Shaker cards are super trendy nowadays! We usually need lot of products to make a shaker card, like foam tape, dies , acetate and more but SEI has an amazing product to make the whole process of shaker card making super easy. Here are the easy shaker makers... they are self adhesive plastic Shaker windows. 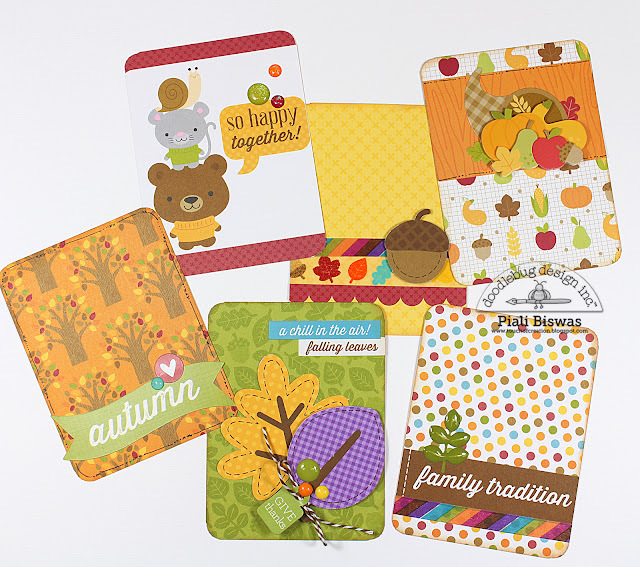 These shaker windows are fabulous, super easy to use and I can make shakers cards without any special products. SEI shaker windows fit perfectly with the circle & square diecuts from Daydeamer sundries pack. I simple used the diecuts & shaker windows to make easy peasy shaker cards. I used the card pack for all 3 cards. I also used Tumble Dye Glitter spray for the splatters. I like how the glitter dries on the surface and leaves a beautiful shine. Love how all the diecut pieces and stickers work together. 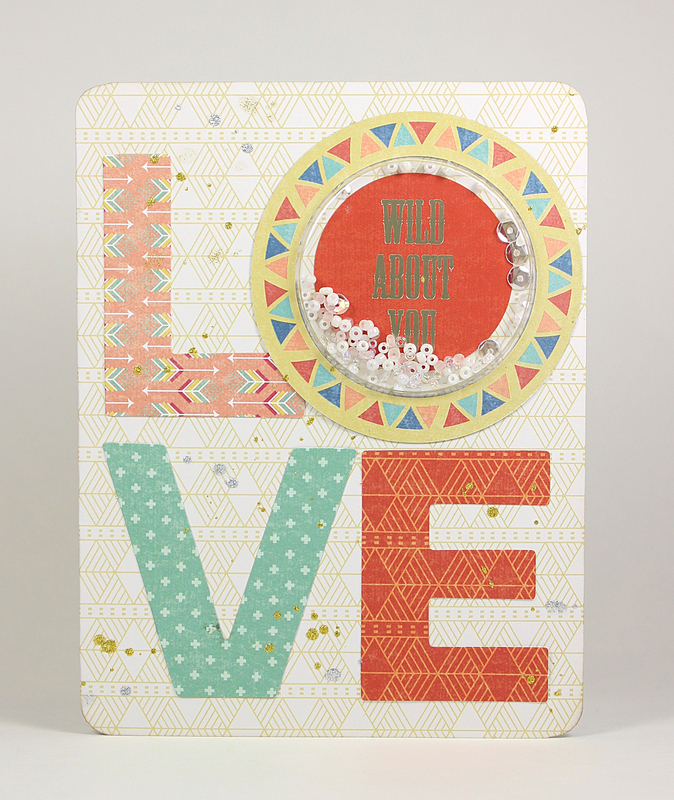 Beautiful diecuts have foiled accents...love it!! Hope you like the quick & easy shaker cards idea!! I'm on DCWV blog today sharing a Fall project. In our home we like to have a message board for all our invites, school forms, notes and all important little things. I like to decorate the message board according seasons...so here is a Fall Themed one. I'm so glad DCWV release the oversized stacks... it made this project to easy!!! I used DCWV 16 x 20 Burlap Stack for the background...love the texture and color of the gray burlap. It was so easy , as one piece of the oversized burlap covered the whole entire 16 x 20 frame, no joining , no seam . I added a foam board behind this burlap so we can use push pin to attach the papers or messages. Also sponged some inks using DCWV 12 x 12 stencils. I also used 11 x17 Double sided printed -Heirloom stack , accordian folded it and adhered it. For the beautiful leaves I used digital cut file from The Cut Shoppe and DCWV-The Glided stack , one my favorite. Love the gold foiling on this papers , I also used Mariposa stack for one of my leaves. In addition to papers, I added few things from our backyard, real acorns, pine cones and a sprig. I sprayed the pine cones with Gold spray. To finish off I added paper embellishment I made from the gold foiled paper and cardstock. This project is very pretty in reals but it was very hard to capture in the photograph. Hope you like the project idea!!! Creative Corner - Anything but card. 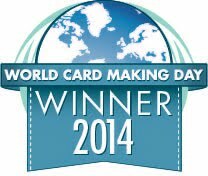 I have a card to share with you all!! My daughter went for a birthday party today so I quickly whipped up a birthday card. I used Reverse Confetti- Later Alligator stamp set , I won it over at Lisa Henke's blog. Thank you Lisa, I love this set!! 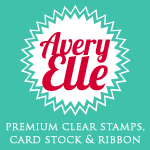 The patterned papers are from Avery Elle ...one of my favorite one! Pile It On - Birthday. Hope you like this card! 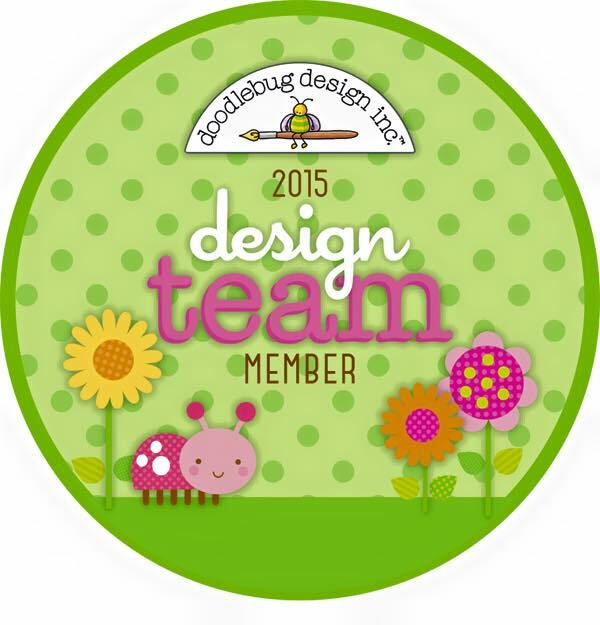 I'm on Doodlebug Blog today!! New Fall collection is out.... its called Fall Friends!! 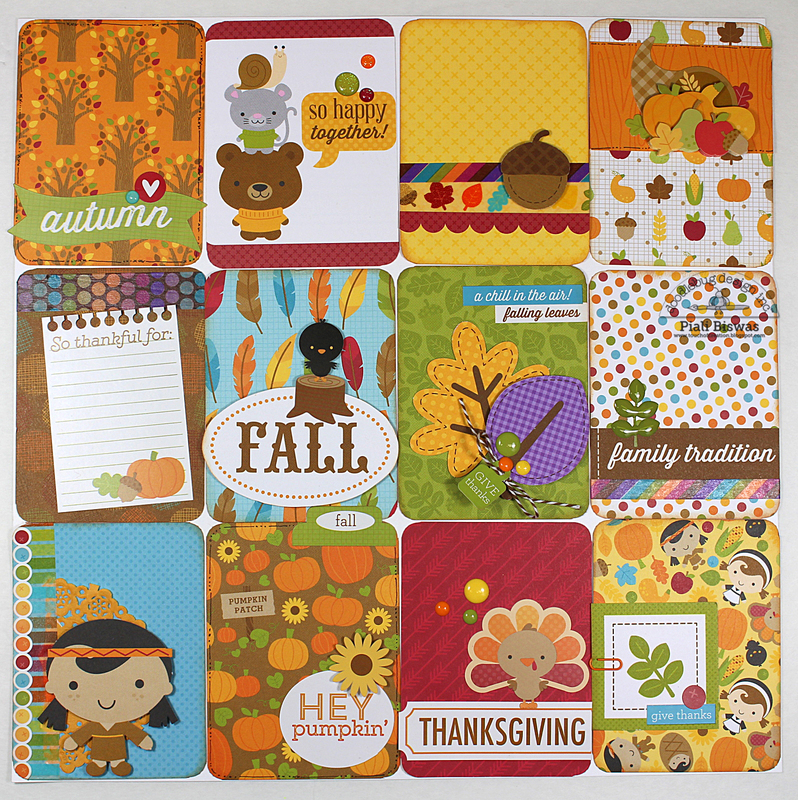 I used this super cute new FALL FRIENDS collection today. I made some 3x4 pocket cards. My daughter likes to make pocket pages album, so I thought I will make some 3x4 cards so she can add them with her photos. I used the washi tapes, fancy frills , stickers, sprinkles, craft kits and twine from the collection. I also used some mini doilies. 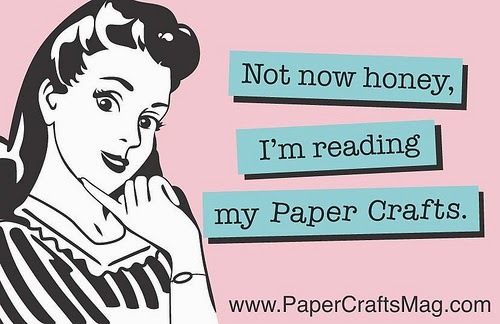 These cards can make a great gift for crafty friends too. These cards are super fun to make!!! Here is two cards using some of the 3x4 cards I made. Hope you all like this project. Today I have card using DCWV September Stack-a-holic challenge sketch. 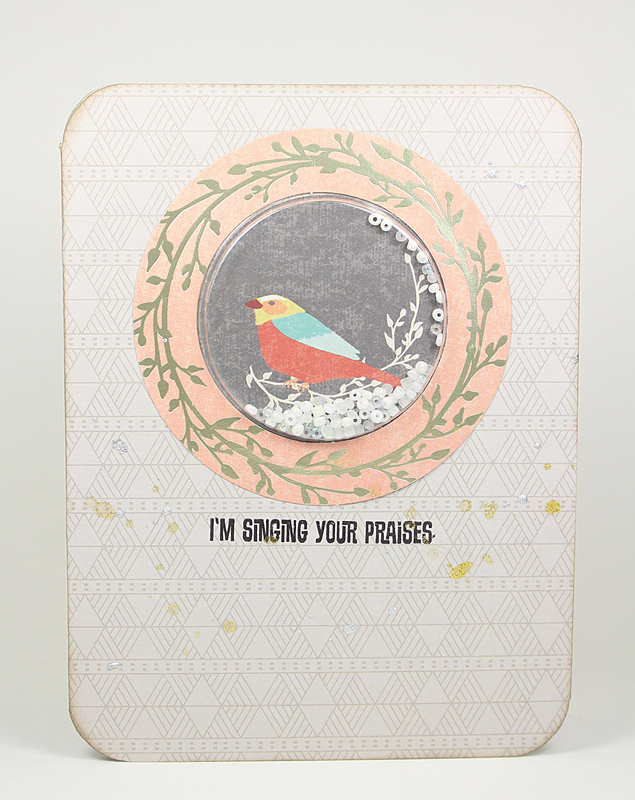 I used teh new DIY Banner stack for this card. The blue corrugated card is also from DCWV. The hello die is from Simon Says stamps. A CAS hello card with few DCWV mirrored star embellishment. Simon Says Stamp - Make it colorful. 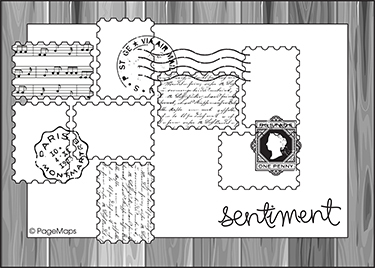 Creative Moments - Anything goes+ sentiment. Its time for DCWV September Stack-a-holic challenge. I used New DCWV-Hello Darlin stack . Love that paper stack!! For my background I used a fun print paper from 11 X 17" stack. 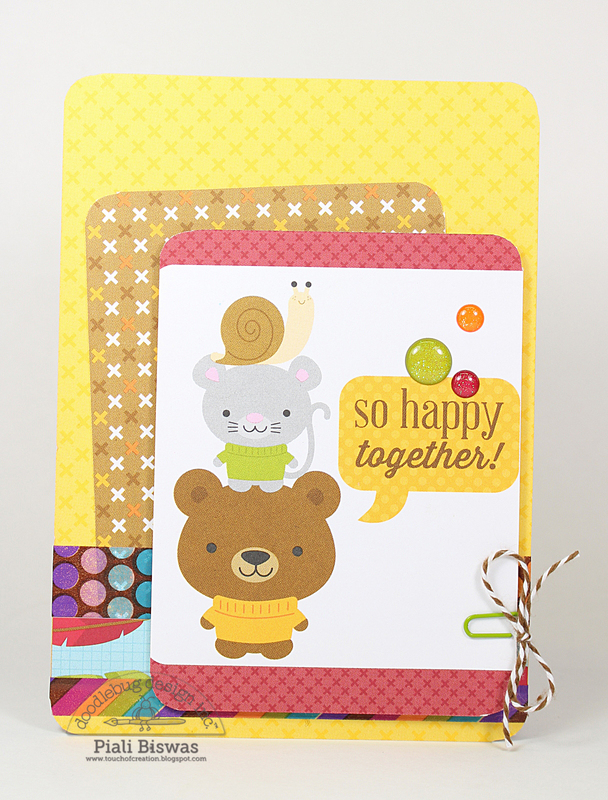 I love the gold accents in the Hello Darlin' stack papers...absolutely gorgeous!!! I used Silhouette cut files for the title and " All Smiles" . The laser cut DCWV paper from specialty pack was perfect match for the Hello Darlin' papers. "Our story" print is from Happy Day stack. I also used the 12 x12 DCWV stencil for the background. The stamps are from Bella's Creation. I love this photo of my younger one & me from our recent trip to Canada!! We both don't like to get out picture taken, so we rarely have photos together. I'm so glad Anushka took this photo!! Hello Darlin' , Happy Day, 11 X17" stacks are available at Joann stores. Crafting By Designs - Anything Goes. If you want play with this month's sketch and win some fabulous DCWV goodies ...hop over to DCWV Blog. I'll be back later with the Card sketch project.